Here at CoSchedule, we follow the philosophy of planning your work, then working your plan. And for content creators, there’s no better organizational hub than a well-planned content calendar. When your entire strategy is planned out on one calendar, it’s easier to keep organized, focus on deadlines, and be more productive. Now that we’re deep into 2019 marketing planning season, you’re thinking about your strategy for the new year. You’re starting to plan out your content marketing strategy for the new year. Working ahead is working smart. You’ve made the resolution to get more organized. You’ll thank yourself for that decision later. Or, maybe you’re flying by the seat of your pants, wishing you had a tool that could corral your content. If so, you’ve come to the right place. In any scenario, a content calendar should be a key piece of your organizational strategy. There’s a reason major publishers use editorial calendars to plan content throughout the year. Content marketers should follow their lead. In this post, we’ll show you how to build one and keep it full all through 2019. 2019 Content Calendar Template to map out your content all year long. Printable Paper Content Calendar Template if you want to go old-school. 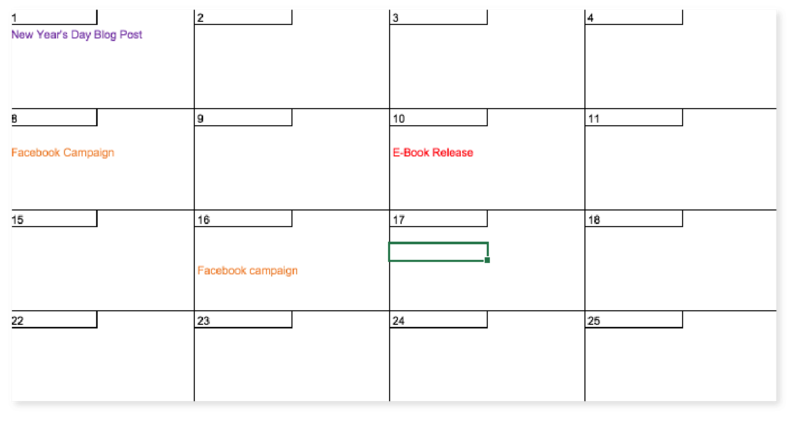 Social Media Editorial Calendar Template if social media marketing is your sole focus. 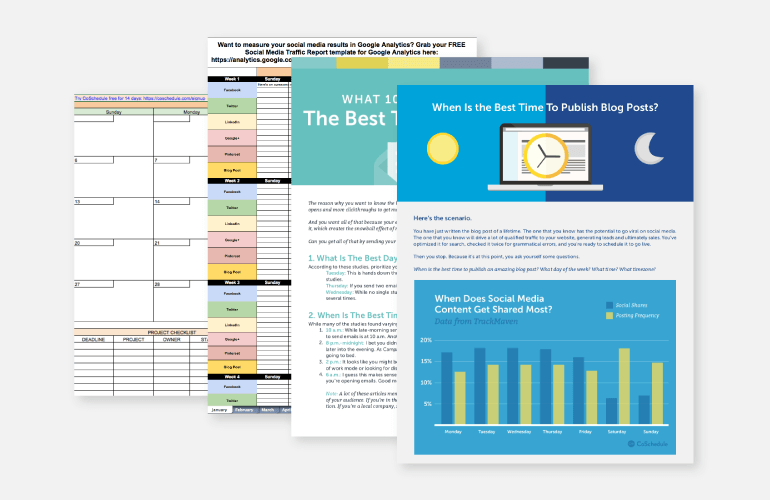 Plus, we’ve included four bonus content scheduling templates and infographics to help publish every piece of content at the best time. Snag your free templates now, and then read on to learn how to use ’em. Grab your free 2019 content calendar template from @CoSchedule! There are a lot of different types of marketing calendars out there. You might see them called a "blog calendar," or a "social media calendar," or an "editorial calendar." Their basic purpose is the same no matter what they're called, though. A content calendar can be anything used to plan, schedule, and organize content and other marketing projects. Printed calendars. This is the old-school hardcopy solution. Spreadsheets. Excel and Google Sheets can be cost-effective tools for building marketing calendars. Apps. This includes premium tools like CoSchedule. Can You Show Me an Example of a Content Calendar? In fact, we'll do you one better: we'll show you the CoSchedule calendar our own marketing team uses. Color-coding. Every type of content and project we plan on our calendar has a consistent color. Blog posts, email newsletters, webinars, social media campaigns, and podcast episodes each have a corresponding color. Marketing Campaigns. The color bands at the bottom indicate Marketing Campaigns. 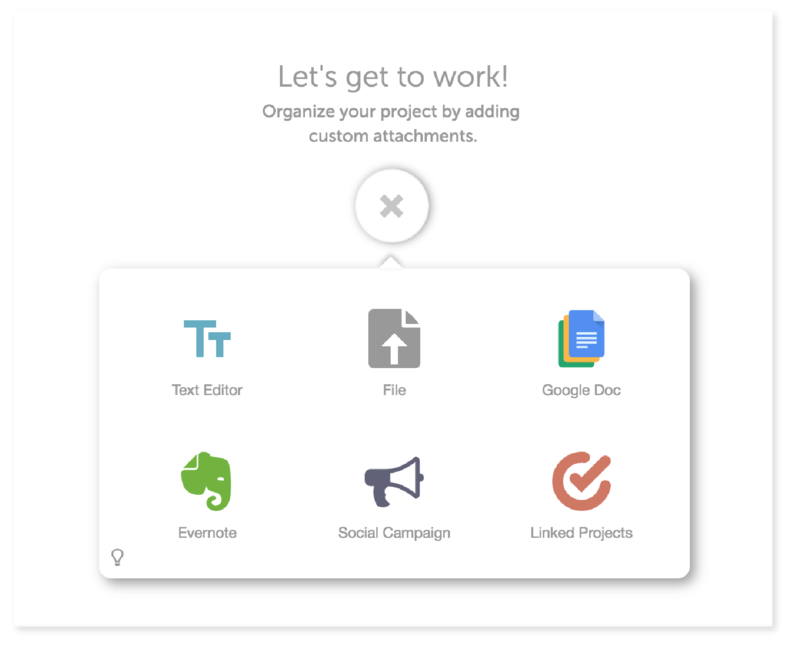 This is a feature in CoSchedule that allows you to place multiple related parts of a project or campaign into one folder. Clicking one of these will create a filtered view showing only the items associated with that project. Filters. These can be used to filter content on the calendar by type, team member, tag, color label, and more. Even if you're using a spreadsheet for your calendar, you can replicate some (but not all) of all this functionality (like color-coding). The easiest answer is because “winging it” doesn’t work. If you don’t have a plan, you’ll end up wasting time you could be spending being productive. That much is nearly guaranteed. And if you don't keep organized, you'll be less likely to succeed. Using a content calendar makes it easier to plan out what you’ll be doing in the future. That could mean a week, a month, or however far ahead you’d like to plan. You could even plan your content marketing efforts for an entire year (like we'll show you in this post). Hit deadlines more easily and hold yourself accountable for getting stuff done. See everything you’re working on in one place. Blog posts, social messages, events, email newsletters, podcasts, videos—whatever you’re busy creating. Think strategically about the content you’ll create. For example, instead of scrambling at the last minute to create content around a major holiday, you can plan for it ahead of time. In short, you’ll work more efficiently and effectively with less stress. That’s something we can all get behind. Now, let’s get into the nuts and bolts of content calendar planning. To begin planning your editorial calendar, start with at least two week's worth of content. If you want to leverage your calendar to its fullest though, you'll plan out as far ahead as you reasonably can. That means allocating space for holidays, seasonal events, and other calendar items you know are going to crop up eventually. Before we get too much further, figure out which content channels and types you’re currently creating, and plan on creating this year. A blog or regularly updated website content. This is likely the bread and butter behind your content marketing strategy. Social media. Determine which networks you'll use to promote your content. Email. According to Campaign Monitor, it's 40 times more effective than social media for customer acquisition. Podcasts. Don't know how to start one? We'll show you. Video. Video marketing is growing in importance, and you can use your calendar to plan every shoot. Print magazines, brochures, or newsletters. The print world is changing, but it's not going away anytime soon. Anything else you're working on. If its a marketing project, you can organize it on a calendar. Make a list so you can lay it all out. The template we've included in this post is meant to make yearly content marketing planning easy.Let's walk through how this spreadsheet is formatted before you begin. To edit your calendar and fill in content, simply click a day and type. It's as simple as that. Tools are only as good as your ability to use them. Content calendars are no exception. 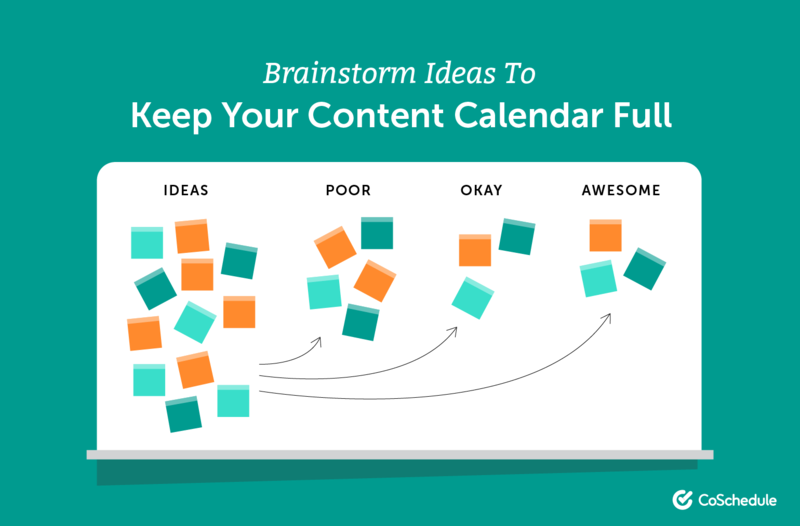 Once you have your calendar on hand, the next step is to fill it with content. But … what content, exactly? The answer: any content you'll create. We could even extend this to include other types of marketing projects, too. That could mean events you're planning or other important dates for your business. Feel free to include anything you’re working on. This is where the real work starts. Before you can fill your calendar, you’ll need ideas to plan around. You’ll need a lot of ideas, and you’ll need them fast, too. That’s where our simple brainstorming process comes in. Spend ten minutes writing down every idea that pops into your head. Don't worry if they're good or not just yet. What's important is getting your ideas down on paper. Spend another ten minutes scoring those ideas on a three-point scale. 3’s are great ideas, 2’s need more refinement, and 1’s are duds. You’ll likely end up with more 1’s and 2’s than 3’s, but that’s okay. Spend ten more minutes choosing which of your 3’s you’ll create or implement. These are the best of your best ideas. 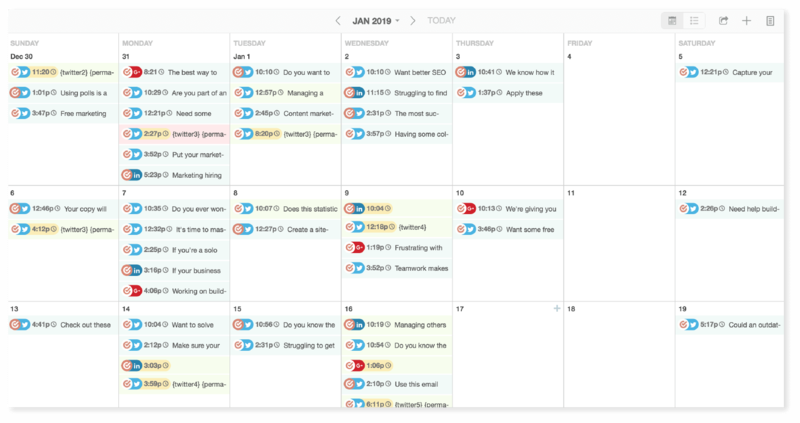 Add a day and time on your calendar to run through this process once a month, and you’ll always have enough ideas to keep your content marketing machine moving forward. Since we’re talking about year-long planning here, it makes sense to discuss seasonal content. If you know you’ll have particular holidays, sales events, or other times of year requiring special promotion, plan that out on your calendar. Holidays. Are there any holidays that are relevant to your business? Peak buying seasons for customers. Are certain times of year better for your business than others? Times of year that have particular importance in your industry. This could include events that have an impact on your business. National Days. National days are a great way to mix up your usual content. Next, consider creating monthly themes for your content. You know how magazines sometimes focus issues around one central topic? You can do that for your content and other marketing initiatives too. A theme could be any broad topic you’ll create multiple pieces of content about during a given month. You don’t need to strictly limit yourself to your themes, of course. However, using themes can make it easier to brainstorm content ideas (since you’ll have a target to think around) and help your audience know what to expect from you month to month. They can also help you build authority around particular topics, helping you become known as a go-to source for that particular information. 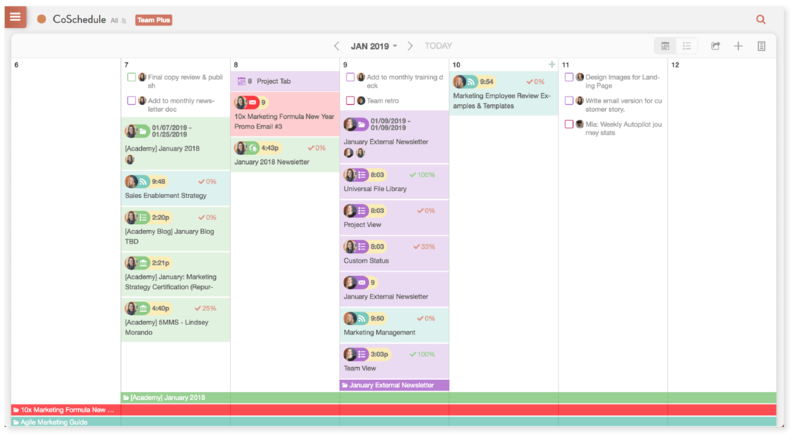 A color-coding scheme can help quickly identify content on your calendar. It should be agreed upon by everyone who will be using the calendar. Everyone should know which colors refer to which types of content. It should be consistent. If you decide Twitter messages are always highlighted in green and your graphic designer’s tasks are always in blue, it’s important to keep that straight. Otherwise, you can run into confusion and missed deadlines. It should be simple. Try to use only as many different colors as you need. Here's everything you need in a content calendar. By campaign. 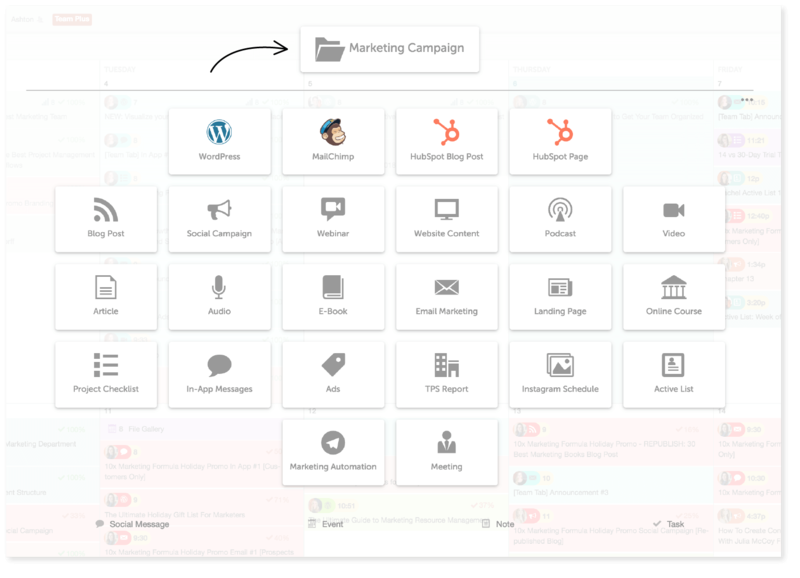 If you’re creating campaigns that span multiple channels, then color-coding each piece of that campaign can make it easier to see when each piece will be publishing. By theme. Similar to color-coding by campaign, if you’re creating content across channels around a theme, it can be helpful to see each piece that belongs to that theme at a quick glance. By team member. If certain team members have content or tasks they’re responsible for; this can help them see everything they need to get done, and when. By channel. If you’d prefer, you can also color-code content based on channel (ex: all Facebook posts in blue, all YouTube videos in red, all blog posts in orange, etc.). Do This With CoSchedule: CoSchedule has built-in color coding functionality, called Custom Color Labels, to keep your scheme consistent. Or anything else your marketing team is working on. 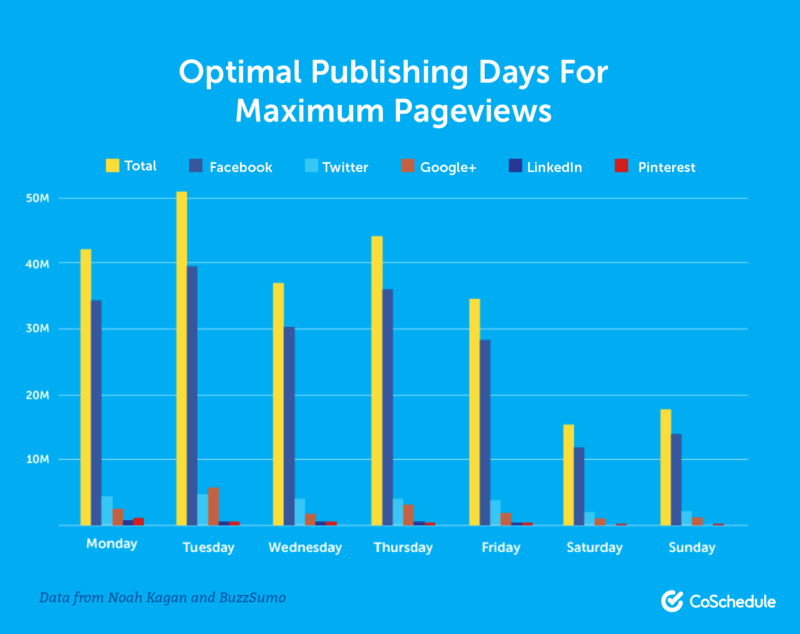 Then, you'll need to optimize your schedule and publishing frequencies. 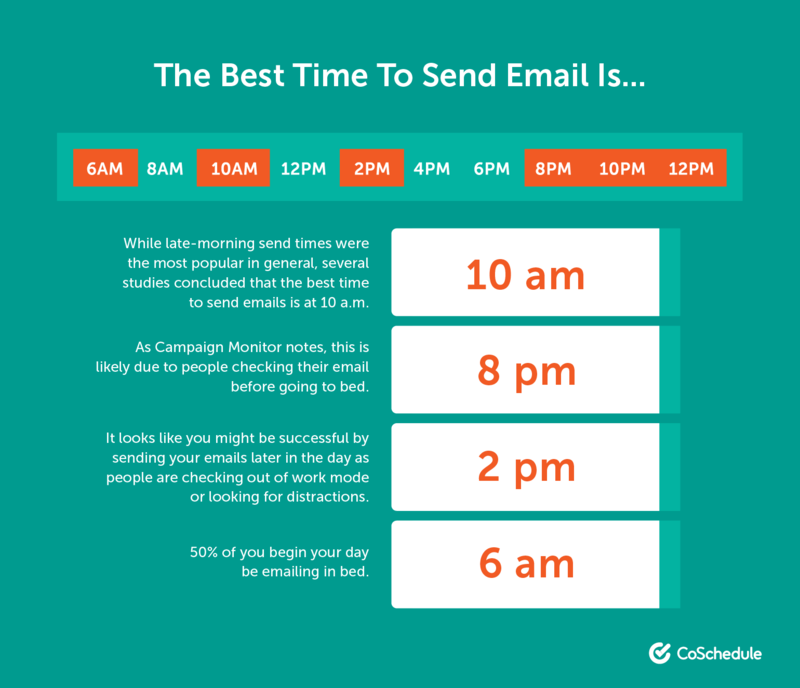 Here are the best times to schedule different types of content. 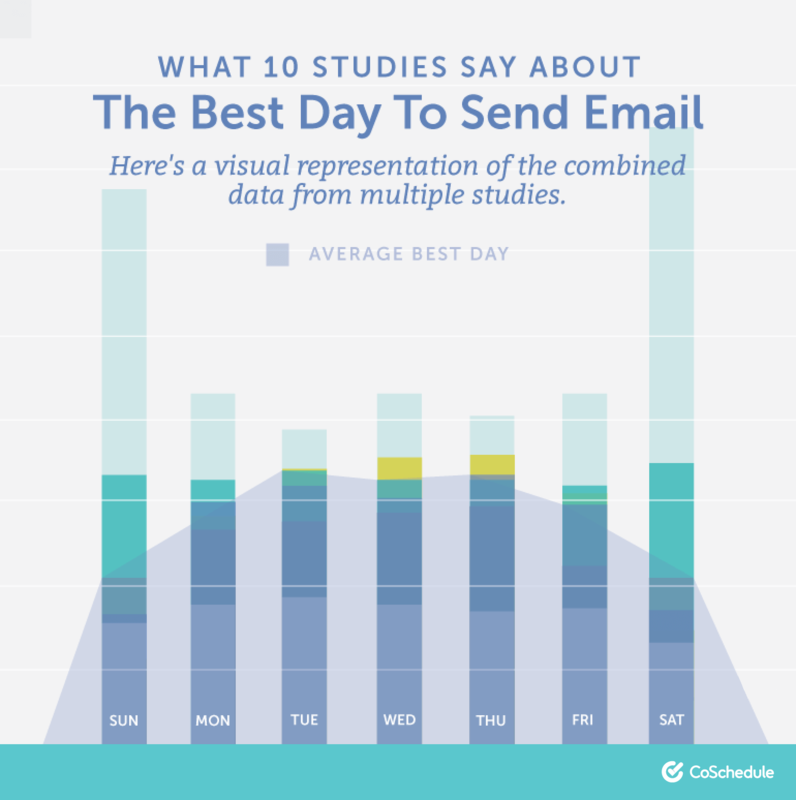 Recommended Reading: When is the Best Time to Publish Blog Posts? If you’re a solopreneur or otherwise working alone, this step is easy. If you’re working on a team though, it’s helpful to have one person be in charge of overseeing the calendar. Of course, you can have team members add their own stuff, and make them responsible for hitting their deadlines. However, having one person keeping an eye on everything can be helpful. Giving team members a nudge if their projects are nearing a deadline. Ensuring the timing and planning of content and marketing initiatives makes sense. 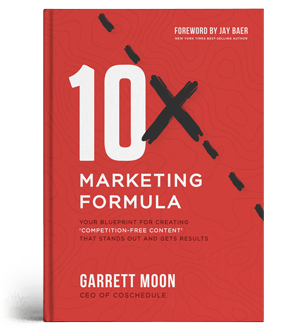 your marketing goalsYour calendar should be your single version of truth. If it's on your calendar, it should be an actual project that you're really going to create, and it should be tied to . Throwing a red flag if something looks off. If something doesn't look right, it's this person's job to call it out. This person can be anyone on your team who is suited for this task. Who should be in charge of managing your content calendar? How Does CoSchedule Make Content Calendar Management Easier? 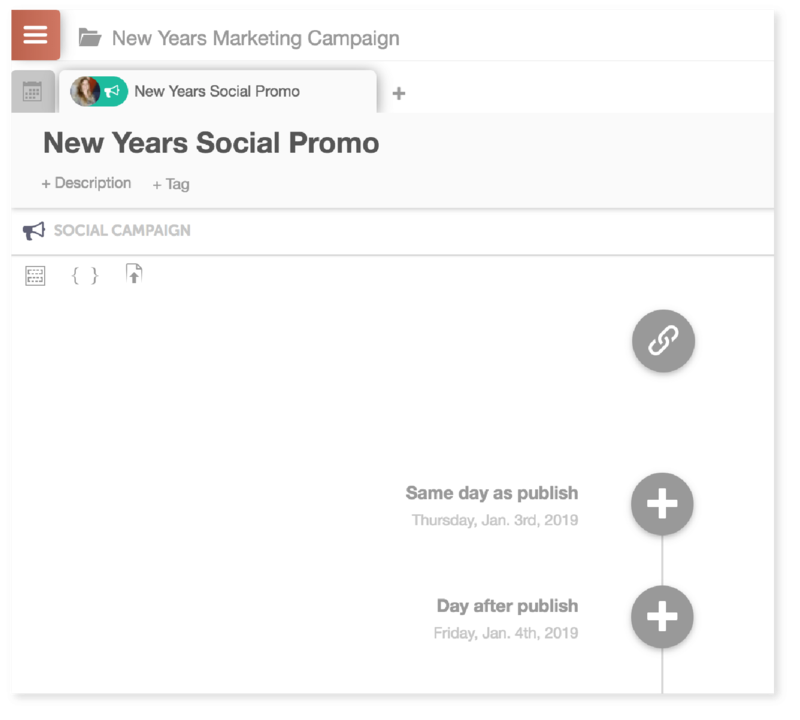 You now know everything you need to build a content calendar and keep your marketing plans organized for the entire year. Best of all, getting started isn’t going to take a ton of time, and the benefits will pay off all the way through 2019. 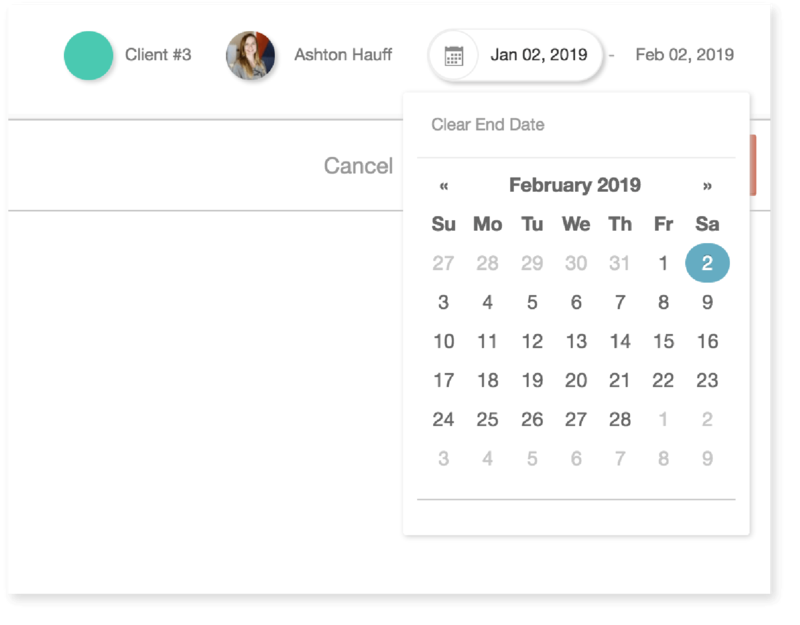 If you’re ready to move beyond paper and spreadsheets, CoSchedule is the next step forward when it comes to content calendar tools. 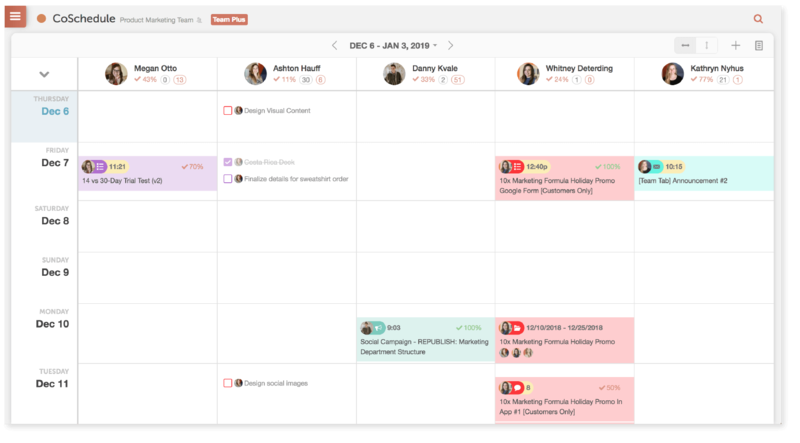 Let's look at how it helps marketing teams get organized, save time, and manage all your content on one calendar. 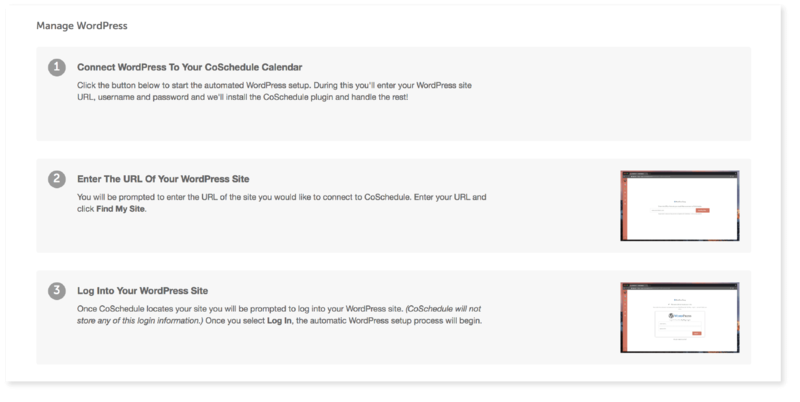 CoSchedule integrates seamlessly with one or multiple WordPress blogs to automate your publishing. Create a new WordPress post. 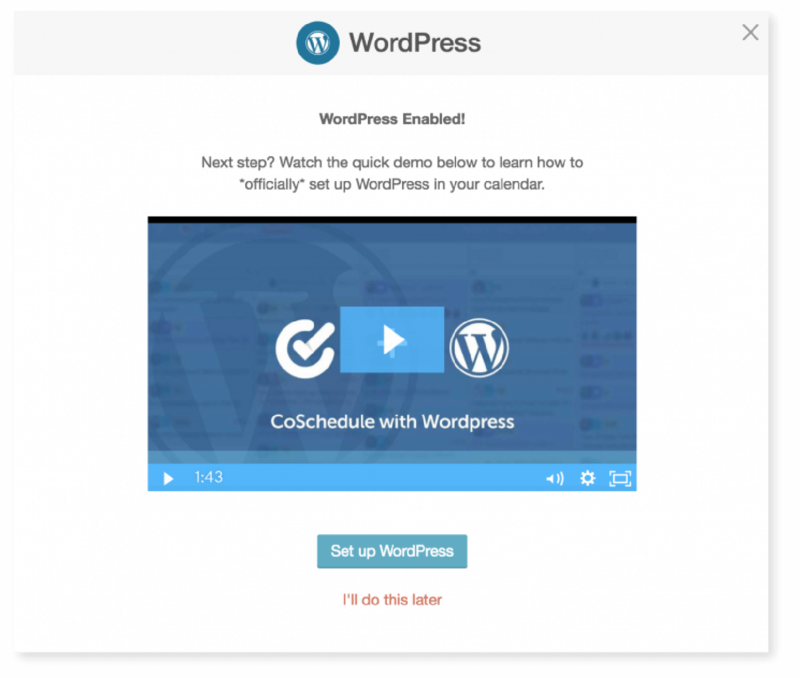 Clicking the WordPress option will create a new post on your calendar. Using the built-in text editor. You can also write posts inside CoSchedule using the text editor. These can then be exported as HTML or converted directly into WordPress posts. Upload a Microsoft Word file. If you like to write posts in Word, you can upload them to CoSchedule and convert them to WordPress posts. Attach a Google Doc. You can also attach files from Google Docs and convert them into WordPress posts. No matter how you prefer to write, CoSchedule is designed to support your workflow. Once you've created a new content item, it'll appear on your CoSchedule calendar. 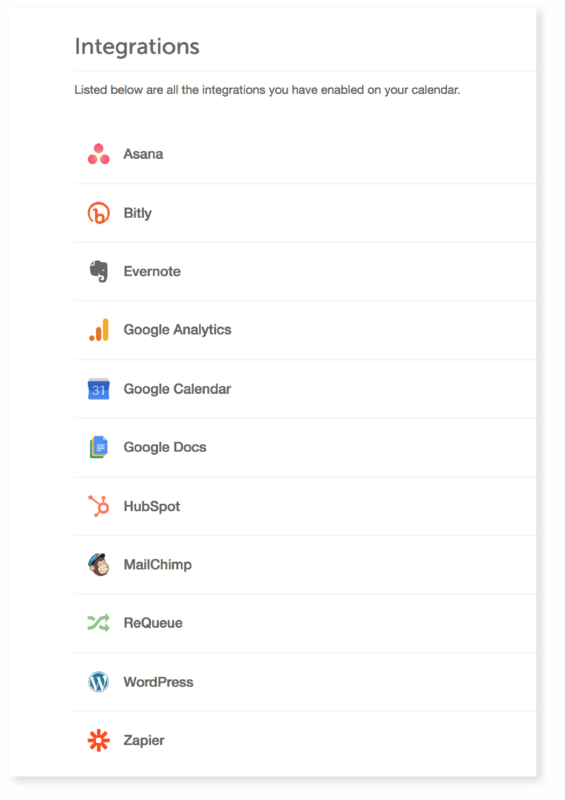 CoSchedule’s intuitive drag-and-drop interface makes it easy to see all your content in one place, move things around wherever you need, and save time planning your work. Plus, with built-in email notifications, you’ll always be alert when things are due. What if you have a campaign that spans multiple projects or pieces of content? That's when it's time to start using Marketing Campaigns in CoSchedule. Continue until you've added every piece of your marketing project. They'll all be easily accessible on your calendar in one unified folder. 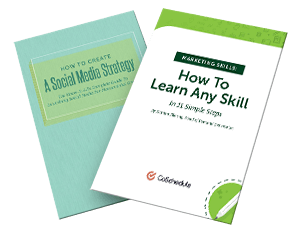 Once you've created a piece of content, you'll want to promote it on social media. 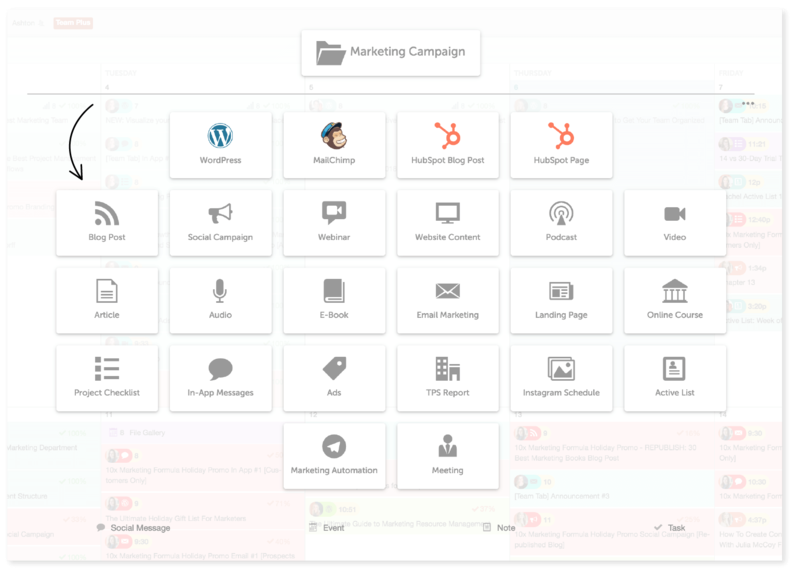 Did you know @CoSchedule integrates with @WordPress and all major social networks? Plus, with Social Templates, you can quickly set up social media campaigns to promote your content. Plus, you can save even more time scheduling your social promotion. 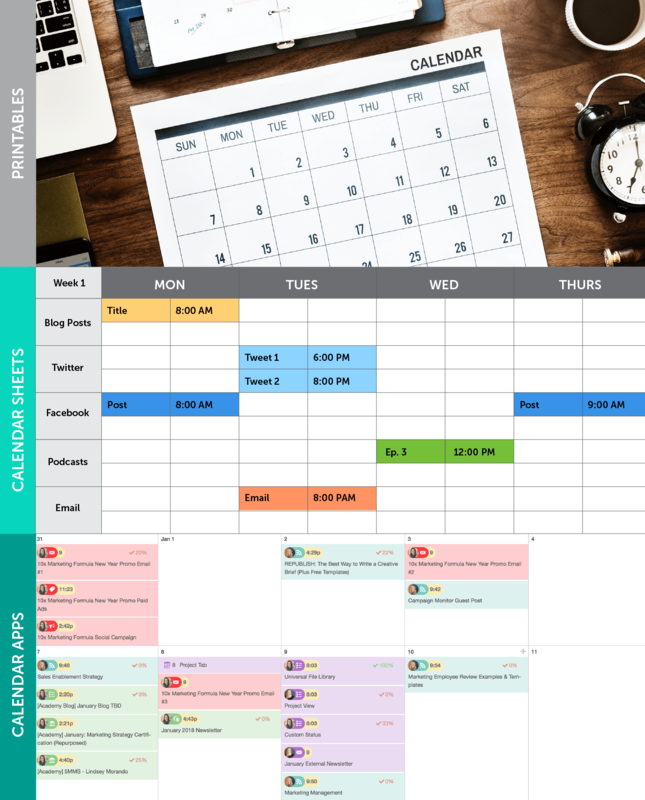 With Best Time Scheduling, you can create social media messages directly in CoSchedule, and let our tool schedule them to publish at optimal times. No more guesswork. Recommended Reading: What is the Best Social Media Scheduling Tool on the Market? When you’ve created something really great, you’ll probably want to share it on social media more than once. ReQueue allows you to easily create content categories, add social messages, and then reshare them automatically in the future. Ready to try CoSchedule? Start with your free 14-day trial. You’ll get to test all our features yourself to see if it’s the right content calendar platform for you. Regardless of which tool you choose though, we hope this is the year you get more organized and produce better work than ever. Now go out there and do better marketing with your new content calendar. This post was originally published on Dec. 7, 2018, and was updated on Dec. 13, 2019.